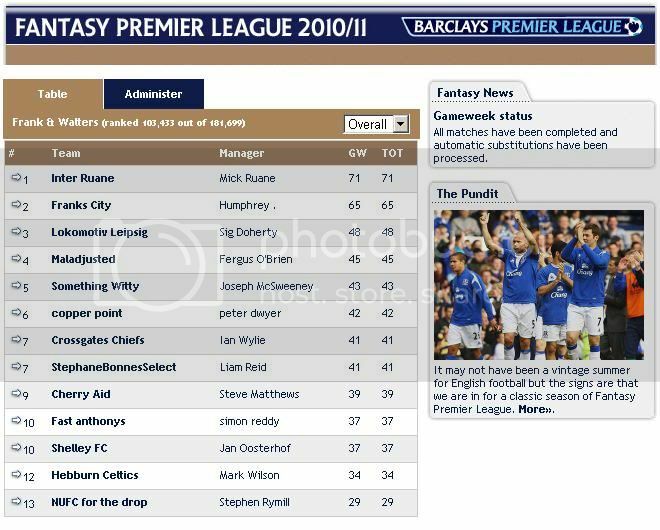 anyone have any interest in doing a mini league for the 2010/11 season fantasy football? v easy to set up a little Franks League between us? lets get as many involved as possible. I'm in! What's the prize? ash wrote: I'm in! What's the prize? the winner gets to name the new album...?! Mon lads, get your teams in. Dan, its lucky you cant pick any Celtic players! Fantasy Football teams must be entered by the weekend. i was late signing up but i'm in now, do i get any compensation? or even sympathy? I was a bit late joining too . We just have to play catch up now for the rest of the season!! We might have to have a mini league Steve!!! anyone know how I can post an image up here? I want to post up an image of the league table weekly? Ash- we could potentiality start the league on week 2- ignoring last weeks points. Would anyone have any objections to this? That way we all start on a level playing field? peterdwyer wrote: Ash- we could potentiality start the league on week 2- ignoring last weeks points.